KERONE offers energy efficient custom infrared ovens used for stationary batch processes. Some applications include mould pre-heating, glue activating, drying, fusing, annealing, and curing. A reliable custom control panel can be supplied for the oven with optional timers, precise solid state controllers, and sensors as required. We also offer custom carts or racks to transfer or hold your products. 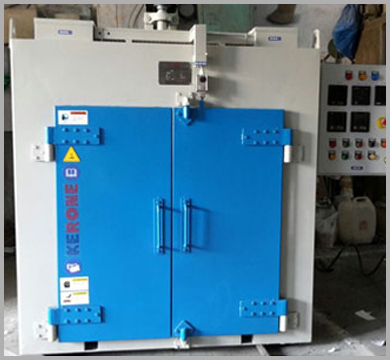 All batch ovens are completely factory assembled, set up and tested prior to shipment to assure a simple trouble free start up.